A specialized robust and highly dependable chimney inspection camera with infrared LED illumination, 25 to 40 meters flexible push rod, large color monitor, recording capability and a 1/4" CCD Sony Super HAD camera chip. 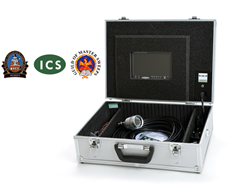 The LookSee PRO is a professional inspection camera ( http://www.fiberscope.net/ir-chimney-inspection-camera.html ) designed particularly for chimney checkups. The technical characteristics and advanced features of the system exceed current industry standards. The camera is equipped with a sensor activating 14 infrared LEDs. Compared to most other cameras of the same type ( http://www.fiberscope.net/chimney-cameras-hvac-cameras.html ) that use white LED illumination, infrared lights noticeably increase the observation area and allow inspecting spots at a greater distance from the camera head. For increased protection the sensitive 52 degree FOV camera head of the unit is shielded from possible accidental damage by stainless steel housing. The lens is made out of 4mm thick toughened glass. The design of the camera head allows the user to replace the glass on the spot if the need ever arises. In addition, the camera head comes with an adapter to secure connecting rods or brushes to help push the camera up into the chimney, and to rotate it to view downwards. The standard length of a flexible push rod is 25 meters (82 feet), although customized lengths of up to 40 meters (131 feet) are available upon request. The LookSee PRO chimney camera stands out for its superb image quality. This is thanks to a large 7’’ TFT LCD monitor and a 1/4" CCD Sony Super HAD camera chip. The captured files are recorded directly onto an SD card. The system comes in a convenient carrying case for easy transportation. These great features will without any doubt make this UK engineered and built camera a sales hit. The LookSee PRO combines reliability, quality and cost-efficiency which make chimney inspections a much easier task.